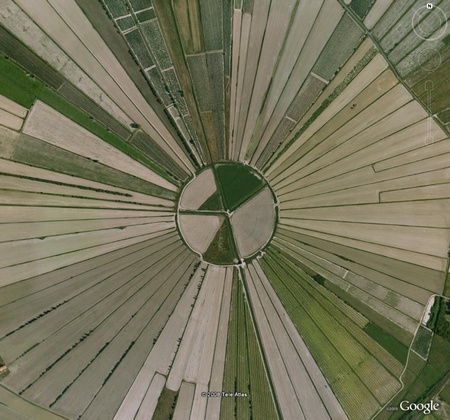 This fantastic looking landscape shows irrigation ditches and the adjoining crop fields in the pond of Montady, near the ancient Oppidum (hill-town) d'Enserune in France. The pond at Montady was originally a brackish marsh of stagnant water. In the 13th century, the swamp was drained by constructing several ditches which allowed water to flow to the centre of the circular depression, from where the water was conveyed through a subterranean gallery to the valley several kilometres to the south. This masterpiece of medieval drainage system which had created about 420 hectares of arable land, is still functional and remains in use.